Microsoft System Center Advisor, formerly Project Atlanta, is a database-configuration system designed to help database administrators root out problems before they begin. Late last year Microsoft introduced Project Atlanta, its first cloud-based application focused on database administrators (DBAs). At the Microsoft Management Summit in Las Vegas last month, the company made the "release candidate" version of the product available and announced its official name -- System Center Advisor. In a nutshell, Advisor is a database-monitoring application that lets the DBA leverage the power of a system like Microsoft System Operations Manager, but without having to install and configure it. System Center Advisor works by way of an agent that you install on the SQL Server computer running in your company’s data center. The agent collects a variety of metrics and transmits them to Microsoft for analysis. System Center Advisor will then raise an alert within the Web interface if there is a problem with the configuration. System Center Advisor, released as a public beta at November’s Professional Association for SQL Server (PASS) conference in Seattle, is easy to sign up for and to configure. Simply navigate to www.systemcenteradvisor.com and register using your Windows Live account. After signing up, you’ll be taken to the dashboard. Before System Center Advisor agent is installed, the dashboard looks pretty boring -- without monitored servers there is nothing to see. Download the installer by hitting the server button on the left, then clicking on the “Add Server” button -- you need this to put System Center Advisor on the servers you want to monitor. You only have to download this package once, and then you can use the single installer package to put System Center Advisor on all your servers. You will also need to download the registration certification Microsoft provides. Do not give this certificate to anyone or post it on the Internet. This certificate is what allows the servers to upload data to your Atlanta account, and it will be needed for each server that’s configured as a gateway. You can run System Center Advisor even if all your servers don’t have direct Internet access. Just configure a gateway server, which all the monitored servers will send their data to. The gateway server is the only one that needs direct access to the Internet to upload performance data to Microsoft’s servers. When you launch the System Center Advisor installer, you’ll be asked if you want to install the agent, the gateway or both. If you plan on configuring each of your servers to connect to Microsoft directly, install both gateway and agent on the server. If you plan on using a central gateway, install the gateway on the intended server and the agent on each server you want to monitor. Your network configuration will determine which option to choose. When the installer launches, it will install the Microsoft System Operations Manager, but it’s a special build configured to work as the System Center Advisor agent. If you install both the gateway and the monitoring agent, the gateway will ask you to provide the certificate to continue, and then the agent will be automatically configured to connect to a local host for gateway communications. If you install just the agent, you’ll be prompted to provide the fully qualified domain name, or FQDN, of the server that will be used as the gateway. Once System Center Advisor is installed, you can install two services -- System Center Management, which is the System Center Advisor agent, and the gateway service, called Microsoft System Center Advisor Gateway. To upload data to Microsoft’s System Center Advisor portal, both need to be running. 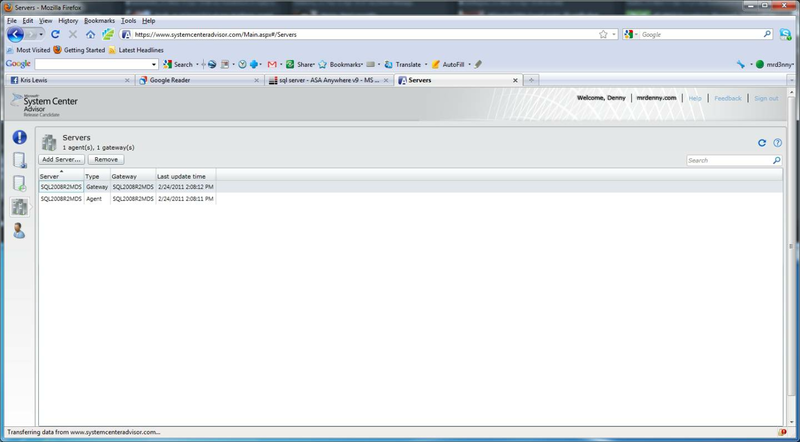 A few minutes after the agent and gateway are installed, they will register on the System Center Advisor portal as shown in Figure 1. Figure 1. This screenshot shows the Servers tab in Microsoft System Center Advisor. Alerts will display under the Alerts tab -- the blue circle with the exclamation mark -- as seen in Figure 1. You can also view the current system configuration for each monitored SQL Server by clicking on the second icon on the left of the screen, and you can view the historical system configuration for each monitored SQL Server by clicking on the third icon on the left. In the release candidate cycle for Microsoft System Center Advisor there are some limitations. Currently, System Center Advisor monitors only Microsoft SQL Server 2008 and 2008 R2. (I would guess that Advisor will be able to monitor the next version of SQL Server, codenamed Denali, shortly after its launch.) The other limitation is that if you are already using Microsoft System Center to monitor your servers, you can’t install System Center Advisor without first removing the Microsoft System Center agent. This is because System Center Advisor uses the same System Center agent. Unlike on the beta, you now can allow multiple users log into the same account within the settings page (the bottom icon on the left of the menu in Figure 1). Users can given either administrator or user access. Administrator access grants the user the right to download the software and configure the account, while someone with user access can only view the data in the portal. Deploying System Center Advisor in your enterprise is fairly easy. The MSI installer can be deployed via a group policy or any other software deployment package. Since the product has yet to be launched, Microsoft has yet to release pricing information. But for companies that don’t have the budget to purchase a large monitoring application such as System Center, Microsoft System Center Advisor looks like it will be a viable alternative -- provided Microsoft doesn’t do something stupid with the pricing. Denny Cherry has over a decade of experience managing SQL Server, including MySpace.com's over 175-million-user installation. Cherry specializes in system architecture, performance tuning, replication and troubleshooting. Check out his blog at SQL Server with Mr. Denny.